Zinc chloride has an importance in pharmaceutical and nutraceutical industries for the prevention and treatment of several diseases. The objective of the current study was to investigate the impact of The Trivedi Effect® - Energy of Consciousness Healing Treatment (Biofield Energy Treatment) on physical, structural, and thermal properties of zinc chloride using PXRD, PSD, FT-IR, UV-vis, TGA, and DSC analysis. Zinc chloride was divided into two parts – one part was control, while other part was treated with The Trivedi Effect® remotely by eighteen renowned Biofield Energy Healers and defined as The Trivedi Effect® Treated sample. A significant change of the crystallite size and relative intensities of the PXRD peaks was observed in The Trivedi Effect® treated sample with respect to the control sample. The average crystallite size of the treated sample was significantly increased by 41.22% compared with the control sample. The size of the particles at d10, d50, and d90 was increased by 8.33%, 6.27%, and 1.83%, respectively in the treated sample compared with the control sample. The surface area of the treated sample was decreased by 5.90% compared with the control sample. The FT-IR spectroscopic analysis revealed that Zn-Cl stretching in the control and treated sample were at 511 and 507 cm-1, respectively. The UV-vis analysis exhibited that wavelength of the maximum absorbance of both the control and treated samples were at 196.4 and 196.3 nm, respectively. The TGA analysis exhibited that weight loss of the treated sample was reduced by 13.98% and 2.43% in the 1st and 2nd steps of degradation, respectively. Consequently, the DSC analysis revealed that the maximum thermal decomposition temperature of the treated sample (489.06°C) was significantly increased by 15.75% compared with the control sample (422.50°C). Moreover, a significant increase in the enthalpy of decomposition was noticed in the treated sample (ΔHdecomp = 131.40 J/g) by 137.10% compared with the control sample (ΔHdecomp = 55.42 J/g). The current study anticipated that The Trivedi Effect® Treatment might lead to produce a new polymorphic form of zinc chloride, which could have better powder flowability and thermal stability. The treated sample could be more stable during manufacturing, delivery or storage conditions than the untreated sample. Hence, the treated zinc chloride would be very useful to design better nutraceutical and/or pharmaceutical formulations that might offer better therapeutic response against inflammatory diseases, immunological disorders, aging, stress, cancer, etc. Zinc is a vital mineral element in human and animal nutrition with a wide array of biological activities. It plays an important roles in catalytic, structural or regulation in greater than 200 zinc metalloenzymes identified in the biological systems [1, 2]. These enzymes are involved in the nucleic acid and protein metabolism as well as for the production of energy. Zinc also maintains the structural integrity of the biological membranes resulting in their protection against oxidative injury . As a metallotherapeutic agent, zinc possesses various pharmacological activities include fertility enhancing, retino-protective, and putative antiviral activities . Zinc is also used in the treatment of Wilson’s disease . It has also immunomodulatory and antioxidant activities . Zinc is also used to prevent the development of several deficiency symptoms include parakeratosis, hypogeusia, anorexia, dysosmia, geophagia, hypogonadism, growth retardation, etc. [5-7]. Recently, it has been reported that zinc had increased the leukocyte count and phagocytic index, which potentiate the immunomodulatory effect along with Glycyrrhiza glabra . Zinc chloride (ZnCl2) is hygroscopic inorganic salt and highly soluble in water . It is sometimes used in pharmaceutical industry as drug and diagnostic agent due to its powerful astringent and mild antiseptic properties . It is also used in mouth-wash and deodorant preparations. Zinc chloride is used in as dentin desensitizer i.e. reduces the sensitivity of the teeth to heat and cold. The other applications of zinc chloride include protein precipitation and insulin preparation [10, 11]. Literature reported that zinc chloride has been used in the treatment of cancer as a destructive agent  and in the pluripotency maintenance of mouse embryonic stem cell through the regulation of STAT3 signaling pathway . It can be useful for the palliative treatment of canine and malignant skin wounds . It has opposite effect on locomotor behavior of rats . Therefore, zinc chloride was considered as one of the component in the novel proprietary herbomineral formulation for the source of zinc ion. This herbomineral formulation is designed as nutraceutical supplement and can be used for the prevention and treatment of various human disorders. An élan vital or vital force which contributes the ‘life’ is preserved by every living organisms and known as prana by the Hindus, qi or chi by the Chinese, and ki by the Japanese. This is believed to co-relate with the soul, spirit and mind. This hypothetical vital force is considered as the Biofield Energy. The Biofield Energy is infinite, paradimensional and dynamic electromagnetic field surrounding the human body. It can freely flow between the human and environment that leads to the continuous movement or matter of energy [16, 17]. So, a human has the ability to harness energy from the earth, the “universal energy field” and transmit it to any living or nonliving object (s) around the globe. The objects always receive the energy and respond in a useful way. This process is known as Biofield Energy Healing Treatment [18, 19]. Biofield (Putative Energy Fields) based Energy Therapies are used worldwide to promote health and healing. The National Center of Complementary and Integrative Health (NCCIH) has been recognized and accepted Biofield Energy Healing as a complementary and alternative medicine (CAM) health care approach in addition to other therapies, medicines and practices such as natural products, deep breathing, yoga, Tai Chi, Qi Gong, chiropractic/osteopathic manipulation, meditation, massage, special diets, homeopathy, progressive relaxation, guided imagery, acupressure, acupuncture, relaxation techniques, hypnotherapy, healing touch, movement therapy, pilates, rolfing structural integration, mindfulness, Ayurvedic medicine, traditional Chinese herbs and medicines, naturopathy, essential oils, aromatherapy, Reiki, cranial sacral therapy and applied prayer (as is common in all religions, like Christianity, Hinduism, Buddhism and Judaism) . Biofield Energy Treatment (The Trivedi Effect®) has been reported in numerous peer-reviewed science journals with significant outcomes in many scientific fields such as cancer research ; altered antimicrobial sensitivity of pathogenic microbes in microbiology [22-24], biotechnology [25, 26], genetics [27, 28]; changing the structure of the atom in relation to various metals, ceramics, polymers and chemicals in materials science [29, 30], altered physical and chemical properties of pharmaceuticals [31, 32], nutraceuticals [33, 34], organic compounds [35-37], and improved overall growth and yield of plants in agricultural science [38, 39]. The physicochemical properties such as particle size, crystalline structure, crystallite size, surface area, etc. and thermal properties of a drug have a vital role in bioavailability as well as stability of the drug during processing, formulation, storage, and packaging [40, 41]. The particle size, specific surface area, crystalline nature, chemical and thermal behavior of an atom/ion might be altered by the Biofield Energy Healing Treatment (The Trivedi Effect®) through possible mediation of neutrinos . By considering all these aspects, powder X-ray diffraction (PXRD), particle size distribution analysis (PSD), Fourier transform infrared (FT-IR) spectrometry, ultraviolet-visible (UV-vis) spectroscopy, thermogravimetric analysis (TGA), and differential scanning calorimetry (DSC) analytical techniques were conducted in this study for the characterization of physical, structural, and thermal properties of the Biofield Energy Treated and untreated zinc chloride. Zinc chloride was one of the components of the new proprietary herbomineral formulation, developed by our research team and it was used per se as the test compound for the current study. The test compound was divided into two parts, one part of the test compound was treated with The Trivedi Effect® - Energy of Consciousness Healing Treatment (Biofield Energy Treatment) by the renowned Biofield Energy Healers and defined as Biofield Energy Treated sample, while the second part of the test compound did not receive any sort of treatment and defined as untreated or control zinc chloride sample. This Biofield Energy Treatment was provided by the group of eighteen renowned Biofield Energy Healers who participated in this study and performed the Biofield Energy Treatment remotely. Eleven Biofield Energy Healers were remotely located in the U. S. A., four remotely located in Canada, two remotely located in Finland, and one of which was remotely located in Albania, while the test compound was located in the research laboratory of GVK Biosciences Pvt. Ltd., Hyderabad, India. This Biofield Energy Treatment was provided for 5 minutes through Healer’s Unique Energy Transmission process remotely to the test compound under the laboratory conditions. None of the Biofield Energy Healers in this study visited the laboratory in person, nor had any contact with the compounds. Similarly, the control compound was subjected to “sham” healers for 5 minutes, under the same laboratory conditions. The sham healer did not have any knowledge about the Biofield Energy Treatment. 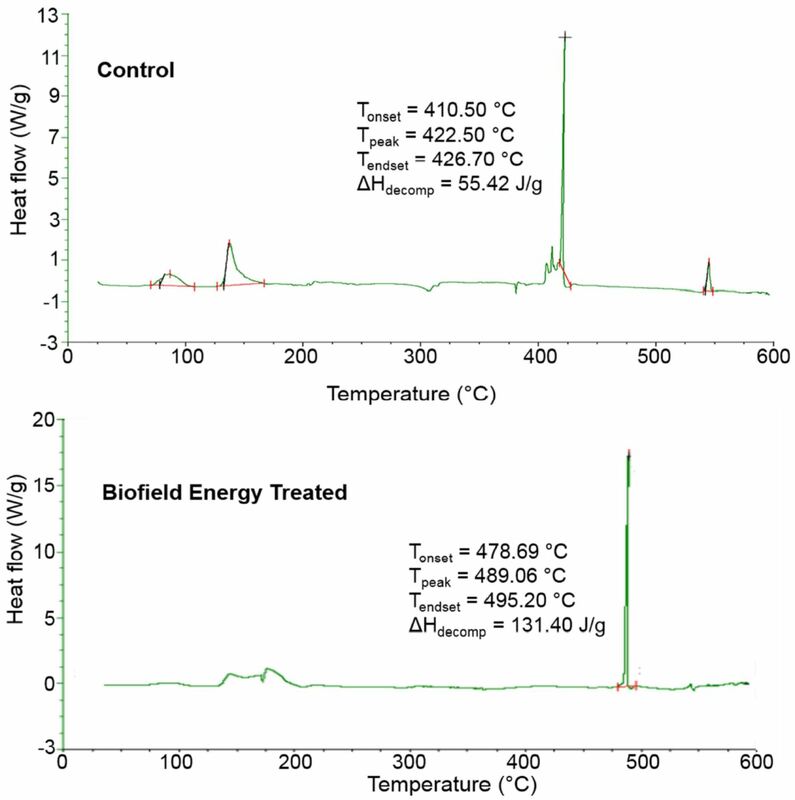 After that, the Biofield Energy Treated and untreated samples were kept in similar sealed conditions and characterized thoroughly by PXRD, PSD, FT-IR, UV-visible spectroscopy, TGA, and DSC analysis. The average particle size and particle size distribution were analyzed using Malvern Mastersizer 2000, UK with a detection range between 0.01 μm to 3000 μm. The sample unit was filled with the dispersant medium and operated the stirrer at 2500 rpm. Alignment of the optics was done and the background measurement was taken. After the background measurement, the sample was added into the sample unit with constant monitoring the obscuration and stopped the addition of sample when the obscuration reached in between 15% and 20%. When the obscuration was stable, the measurement was taken twice and the average was taken of two measurements. The average histogram of the two measurements was recorded. Along with histogram, the data was presented in table format which include particle size (μm). Also, the values at below 10% level (d10), 50% level (d50), and 90% level (d90) were calculated from the histogram and the calculations such as surface area (m2/g) were done by using software Mastersizer 2000. Analysis was performed using the DSC Q20 (TA Instruments, USA) differential scanning calorimeter. A total of ~7.50 mg sample was weighed and sealed in aluminum pans and equilibrated at 25°C and heated up to 600ºC at the heating rate of 10°C/min under nitrogen gas as purge atmosphere with flow rate of 50 mL/min. The value for onset, endset, peak temperature, peak height (mJ or mW), peak area, and change in heat (J/g) for each peak were recorded. 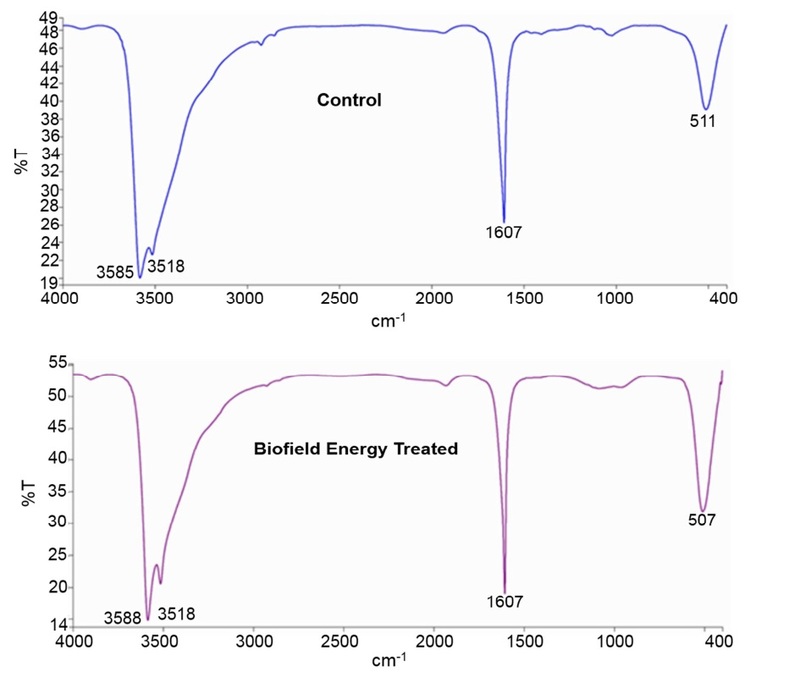 The PXRD diffractograms of both the control and Biofield Energy Treated zinc chloride are shown in Figure 1. Very sharp and intense peaks in both the diffractograms indicating the crystalline nature of zinc chloride. PXRD data such as Bragg angle (2θ), relative intensity (%), full width half maximum (FWHM) (θ°), and crystallite size (G) for the control and Biofield Energy Treated zinc chloride are presented in Table 1. The crystallite size was calculated with the help of Scherrer equation [43, 44]. The crystallite size of the Biofield Energy Treated zinc chloride at 2θ equal to nearly 16.6°, 25.4°, 29.4°, 35.0°, 38.3°, 58.4°, and 61.8° (Table 1, entry 1-5, 7, and 8) was significantly increased from 25% to 133% compared with the control sample. Consequently, only at 2θ equal to ~49.3° (Table 1, entry 6), the crystallite size of the Biofield Energy Treated zinc chloride was significantly reduced by 16.68% with respect to the control sample. 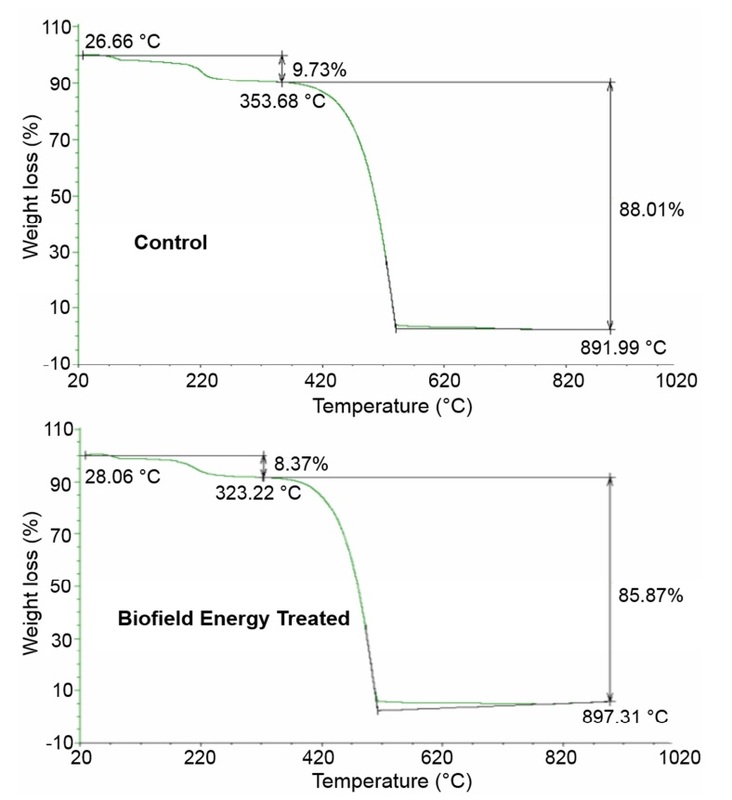 However, the average crystallite size of the Biofield Energy Treated sample was significantly increased by 41.22% (Table 1, entry 9) with respect to the control sample. Raza et al. reported that changes in XRD pattern provide the proof of polymorphic transitions [46, 47]. Crystal habit, size, and even polymorphic form of a drug have a significant effect on the drug solubility, dissolution, and bioavailability. It has been reported in the literature that alteration in the crystal morphology had the significant impact on in vitro dissolution rate, with prospective for improving bioavailability . Hence, PXRD study revealed that Biofield Energy Healing Treatment might be introduced a new polymorphic form of zinc chloride, which could have improved bioavailability as compared with the control sample. 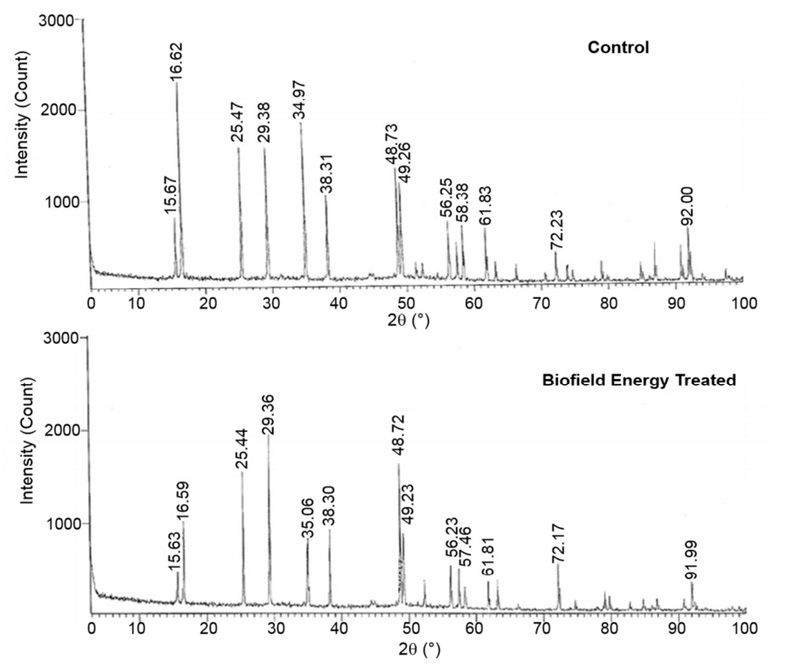 The UV-visible spectra of the both control and Biofield Energy Treated zinc chloride are presented in Figure 3. 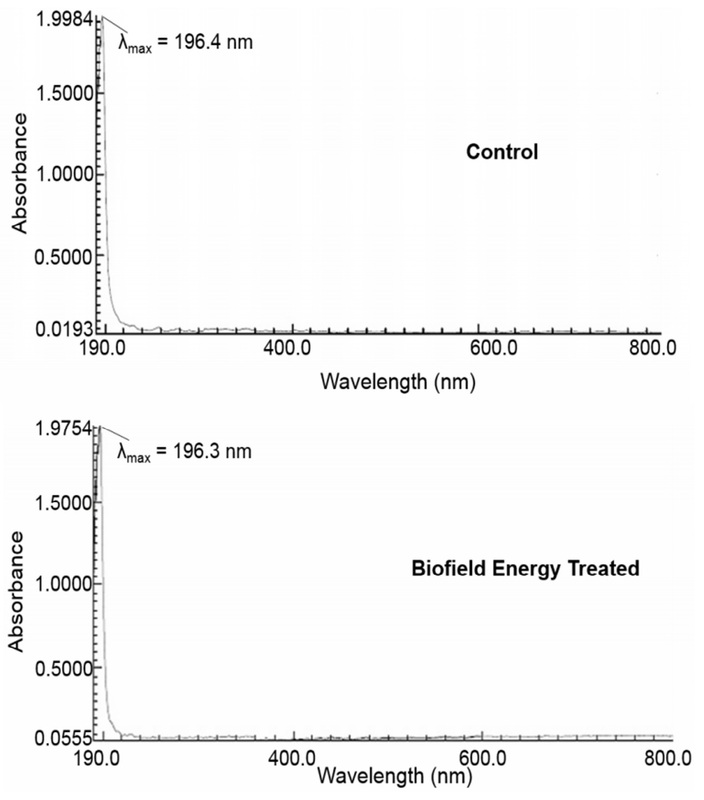 The UV-visible spectra exhibited that the maximum absorbance (λmax) of both the control and Biofield Energy Treated samples were at 196.4 and 196.3 nm, respectively with a minor shift of absorbance maxima from 1.9984 to 1.9784 in the control and Biofield Energy Treated samples, respectively. The UV absorbance occurs due to the different type of energy transitions from the singlet to the singlet excited state such as σ → σ∗ , n → π ∗ , and π → π ∗. These type of electronic transitions are happened when the difference in energy between the lowest unoccupied molecular orbital (LUMO) and the highest occupied molecular orbital (HOMO) is significantly higher than the activation energy of the compound . Ronconi L, Sadler PJ (2008) Applications of heteronuclear NMR spectroscopy in biological and medicinal inorganic chemistry. Coordn Chem Rev 252: 2239-2277. Higdon JV, Ho E (2005) In: M. Gielen, E. R. T. Tiekink (Eds. ), Metallotherapeutic drugs and metal-based diagnostic agents: The use of metals in medicine, Wiley-VCH, Weinheim, p. 237. Alexander L, Klug HP (1950) Determination of crystallite size with the X-Ray Spectrometer. J App Phys 21: 137. Langford JI, Wilson AJC (1978) Scherrer after sixty years: A survey and some new results in the determination of crystallite size. J Appl Cryst 11: 102-113.